Read my previous blog entry in the "NASA Juno Tweetup" series: "Day 2 - KSC Visitor Center, Astronaut Hall of Fame and Endless BBQ"
Jump back to my first blog entry in the series: "Preview of my report"
Well, this is my last post recapping my time at the NASA Tweetup for the launch of the Juno spacecraft. It was an amazing experience stuffed into two action packed days. It's hard to imagine that I almost wasn't able to attend due to some scheduling conflicts. Luckily, it all worked out and I was able to take part in this once in a lifetime experience. 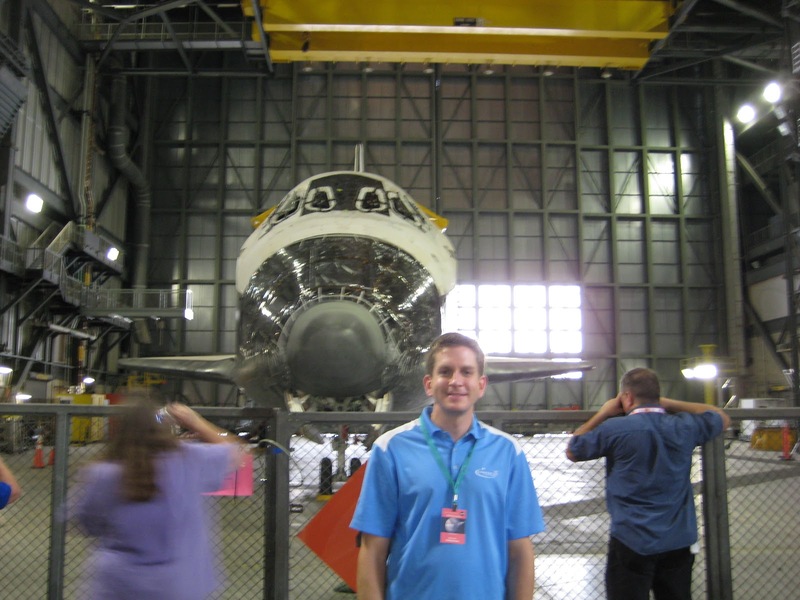 As I look back, I would have to say that the tour of Kennedy Space Center and the Cape Canaveral Air Force Station was the highlight of my time there. The sights we saw will stick with me for many years to come. Standing next to space shuttle Discovery, looking straight up the middle of the Vehicle Assembly Building, and driving by Launch Complex 5, where the American space program started, were the real highlights for me. The guest speakers, demos and launch of the Juno spacecraft were a very close second, but the tour was really something special. The best part about the guest speakers wasn't necessarily the content of their talks, but just experiencing their passion for their work. These were brilliant scientists, engineers and astronauts taking time out of their busy lives to share their passion with 150 Tweetup nerds in a hot tent. Pretty inspiring people to be around. One aspect of the Tweetup I really enjoyed was talking to other participants. It's great to meet people that share the same interests as you, and love to get in conversations about it. There were people from all walks of life, with many different specialties, that all shared an interest in space exploration. The comradery on our tour bus (1A/1B), the people I sat with in the tent, my dinner companions the first night, and the folks I met at the Endless BBQ were all wonderful. All were great people, and I hope to cultivate relationships with them via Twitter and Facebook, and maybe even see them at future NASA Tweetups. Even though I'm not one of the "NASA is dead now that the space shuttle program is finished" people, I did take away the feeling that NASA is alive and kicking. As Charles Bolden said, the unmanned missions are the building blocks to the higher profile manned missions of the future. In many ways, I think the data compiled by the unmanned missions is much more exciting than the manned missions. The Juno spacecraft will travel for five years, over 400,000,000 miles from earth, and study a planet that might give us information about how the solar system formed. That's pretty mind blowing stuff. It's human nature to explore earth and space. Unfortunately, society will find money for wars in the middle of a desert on the other side of the globe before they find money for space exploration. I guess fighting is human nature too. Many people don't realize that space exploration has had many technological advancements as side effects. Sure, we can just save all our money, not explore anything, not advance as a society, and die not having learned anything. I just don't see the point in that. Some people don't see the big picture, but I'm glad to be one of the voices that shares my enthusiasm about space exploration. I wasn't around in the 60's, but I read that the Apollo missions unified Americans as much as WWII did. Luckily, politicians see high profile space missions as a unifying thing, so then they will find money for NASA. When the time comes to send humans to Mars, I hope it will be like the Apollo program all over again. Participation by both NASA and private space companies in space exploration seems like a cost effective way to push ahead. 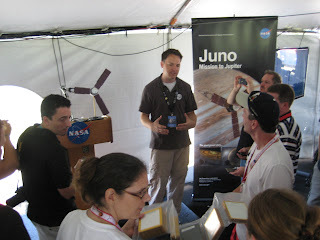 As you may have gathered from my last ten blog posts about the Juno Tweetup, I had a blast (pun intended). 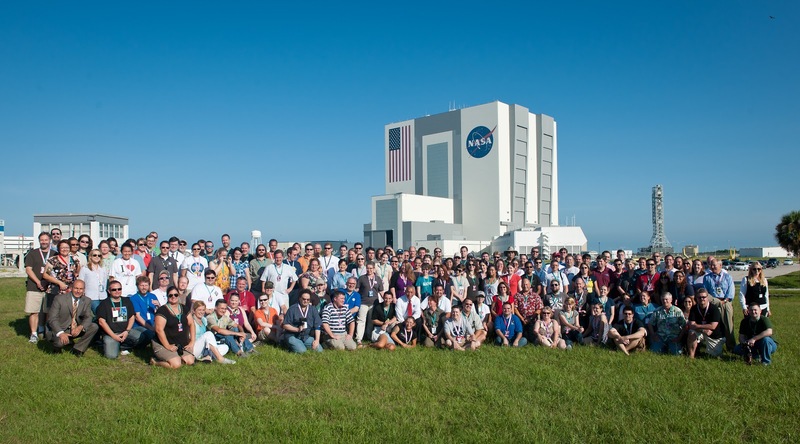 If you have the chance to participate in a NASA Tweetup, don't pass up the opportunity. If you don't think a Tweetup for an unmanned mission will be as exciting as one of the past shuttle Tweetups, I think you're wrong. Heck, the GRAIL Tweetup will have Sally Ride as a guest speaker! Even though this is my last Juno Tweetup recap post, please stay in touch by following me on Twitter and keep an eye on my blog for updates. Writing these blog posts was very fun, since I got to relive all the highlights of my two days at Kennedy Space Center. Thanks for checking out my blog, and I hope you enjoyed reading the posts as much as I enjoyed writing them. 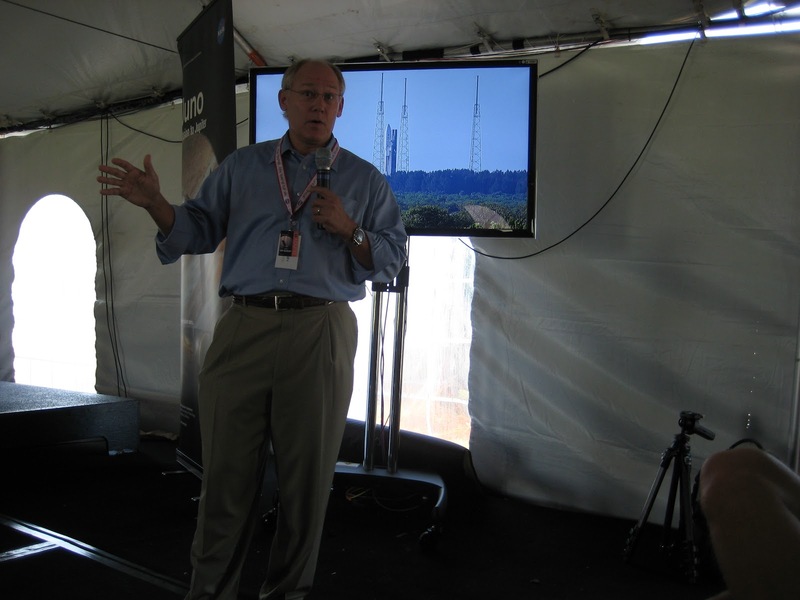 Read my previous blog entry in the "NASA Juno Tweetup" series: "Day 2 - Juno launch"
Day 2 of the NASA Juno Tweetup started with guest speakers and demos in the tent, followed by the successful launch of the Atlas V rocket with the Juno spacecraft. The launch was the final event planned by the Tweetup organizers, but I didn't want my NASA experience to end just yet. Part of our NASA goodie bag given to us on day 1 was a free two day pass to the Kennedy Space Center Visitor Complex and the Astronaut Hall of Fame. I had been to the KSC Visitor Complex a few times in the past, but I decided to use the afternoon of day 2 to check out these attractions again. Since this was launch day, I pulled up to the KSC Visitor Complex and noticed quite a large crowd there. Some of my fellow Tweetup attendees were already inside and were Tweeting that they had never seen it so crowded. That's good news for the space program, but bad news for me. I figured that the pass was free, so I might as well take advantage of the place. Before I entered, I tried to purchase their "Cape Canaveral: Then & Now" tour that brings you out to the original launch sites of the Mercury, Gemini and Apollo missions, as well as a stop at the Air Force Space & Missile Museum. This tour brings you to Launch Complex 5, where Alan Shepard became the first American in space on a Mercury Redstone rocket in 1961. We drove by this pad on day 1 on the way to our Launch Complex 17 tour, but we didn't stop there. This tour also stops at the site of the Apollo 1 launch pad fire that killed Gus Grissom, Ed White and Roger Chaffee. Unfortunately, they weren't running this tour on the day I was there. It looks like a great tour, and it was available the next day, but I wasn't going to be in the area. After the fact, I heard that the Air Force Station also offers a similar (but much cheaper) tour. I wandered into the KSC Visitor Complex and was pretty blown away by the amount of people there. I got a lay of the land, and headed toward the Imax theater for a screening of the space station film. The line for the film was extremely long, and I just wasn't in the mood to wait on it. My next stop was the Rocket Garden, which is various rockets used by NASA during the early years of the space program. I love the history of the space program, rather than the flashy stuff like the Imax or rides, so this is really what I was hoping to see. It was interesting to stand next to a Mercury Redstone rocket and imagine a human on the top of it waiting to launch into space. Those were pretty brave guys to climb aboard those older rockets. The Saturn IB (rocket on its side in the picture) was the kind of rocket that the Apollo 1 crew were in when the launch pad fire killed them. Testing that rocket led to the developemnt of the massive Saturn V, which you'll read more about in a bit. One part of the Rocket Garden is the actual service structure from the Apollo missions, namely Apollo 11, which was Neil Armstrong, Buzz Aldrin and Michael Collins heading to the moon for the first moon walk. I made this little cell phone video of me walking the same service structure that the astronauts did when it was time to load into the capsule atop the Saturn V rocket on Launch Complex 39A. At the end, you can see the tiny capsule they had to climb in. They would be loaded in on their backs, looking up toward space. One part of the KSC Visitor Complex that is a "must see" is the Apollo/Saturn V Center. I have been to it before, but I really wanted to go see it again. You have to take a bus over to it from the main Visitor Complex, and the tour usually includes a stop at the gantry that KSC built along Saturn Causeway that overlooks the Launch Complex 39 (shuttle) pads. That part of the tour wasn't happening due to the Atlas V Juno launch earlier, but I wasn't too disappointed, since I drove right by Launch Complex 39A on my day 1 tour of KSC. After waiting on a long (30 minute) line, I finally got bussed past the Vehicle Assembly Building over to the Apollo/Saturn V Center. Your first stop at the Apollo/Saturn V Center is a reenactment of the launch countdown of a Saturn V rocket. They have the actual firing room computers that were used during the Apollo program. The video and show is quite entertaining. Then you head into the main room, and are greeted with the sight in the picture above: the business end of a Saturn V rocket. NASA had already produced Saturn V rockets when the program came to an earlier than expected end, so the rocket on display here is one of those unused rockets. The Saturn V rocket is so long (36 stories tall), it was impossible for me to get the entire thing in my camera frame. It's raised up about 15 feet off the floor, so you can walk right underneath it and examine all the different sections. It's just absolutely massive. It's funny to see how small the crew capsule is compared to the rest of the rocket. This rocket contained an incredible amount of power to break free of earth's gravity and propel humans 235,000 miles to the moon. 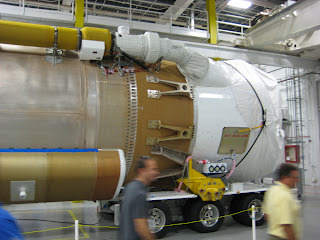 I've heard that the Saturn V rocket was the loudest man made object. This rocket contained as much explosive energy as a small atomic bomb. I would have loved to see a Saturn V launch in person, but I suppose that without a time machine, the Apollo/Saturn V Center is the next best thing. I decided that I would leave the KSC Visitor Complex and head across the NASA Causeway bridge to the Astronaut Hall of Fame. This is included with your KSC Visitor Complex ticket. The Astronaut Hall of Fame does contain a little hall of fame area with pictures of the inducted astronauts, but it's really a great museum showcasing the history of the space program. I really liked this museum as much as I liked the Apollo/Saturn V Center, if not more. They had great exhibits showing the progression of the space program, along with many interesting items to look at. I didn't take a single picture in there, since I was obviously engrossed in the displays the entire time. I was able to join up with a tour group going through the museum, so I got a great dose of NASA history. A couple of times I wanted to correct the tour guide, but I bit my tongue. I stayed there until closing time, and really need to go back to see everything I missed. I highly recommend you spend some time here if you have an interest in the space program, and I assume you do since you're reading my blog post. The last day of the Tweetup ended like other NASA Tweetups have ended, with the Endless BBQ at someone's house. The gracious hosts were shuttle technicians that live in Merritt Island. From what I saw, the crowd was about 50% Tweetup attendees and 50% current or former space program employees. I only took this one picture with my phone, which you can see above, but it really sums up the evening. @CraftLass was singing the Big Bang Theory theme song with NASA TV playing in the background. This BBQ was the perfect way to end the Tweetup experience with a bunch of genuinely nice, fun and interesting people. 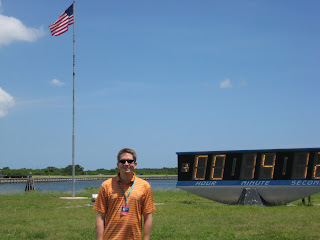 That was the end of day 2, and unfortunately, the end of my time at the NASA Juno Tweetup. My next blog post will be the last in my NASA Juno Tweetup series, wrapping everything up with my thoughts about the whole experience. Read my next (and last) blog entry in the "NASA Juno Tweetup" series: "Reflections"
Read my previous blog entry in the "NASA Juno Tweetup" series: "Day 2 - guest speakers and demos"
After a great day 1 of guest speakers and a Kennedy Space Center/Cape Canaveral Air Force Station tour, and the guest speakers and demos on the morning of day 2, it was finally time to watch the launch of the Atlas V rocket with the Juno spacecraft. I was quite excited for this, since it was my first live launch. I have watched plenty online and on TV, but never in person. After Bill Nye wrapped up the guest speaking portion of the morning, we took a short break and started to get ready for the planned launch time of 11:34am. We had NASA TV on inside the Tweetup tent, all looked to be on track and the countdown was proceeding as planned. We made our way out of the tent to the bleachers on the Launch Complex 39 Press Site lawn. Only four miles away, we could see the tip of the Atlas V rocket peeking above the trees at Launch Complex 41. 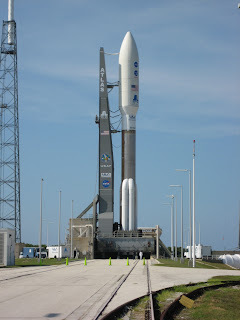 It was amazing to think that less than 24 hours ago, I was standing next to a rocket that will be launching in minutes. Since the launch window was only open for one hour, we were starting to get a tad bit nervous that they wouldn't be able to fix the leak, and they would have to scrub the launch and try again 24 hours later. About 15-20 minutes later, we heard an update that the leak situation was still being discussed by the launch team, and now there was a boat that wandered into the hazard area cordoned off by NASA off the coast of Cape Canaveral. A fishing boat clueless about the launch, or some people trying to get a good view of the launch from the ocean? Not sure, but whoever it was, they were now part of the countdown hold until NASA can clear them out of the area. As my Tweet shows, we had hopes that the 12:13pm launch time would stick, but that came and went with the countdown still holding. The launch window closes at 12:43pm, so we were about 30 minutes away. By now many of us had moved out of the sun and back into the tent, to stand in front of the A/C units and watch the NASA TV feed for updates. 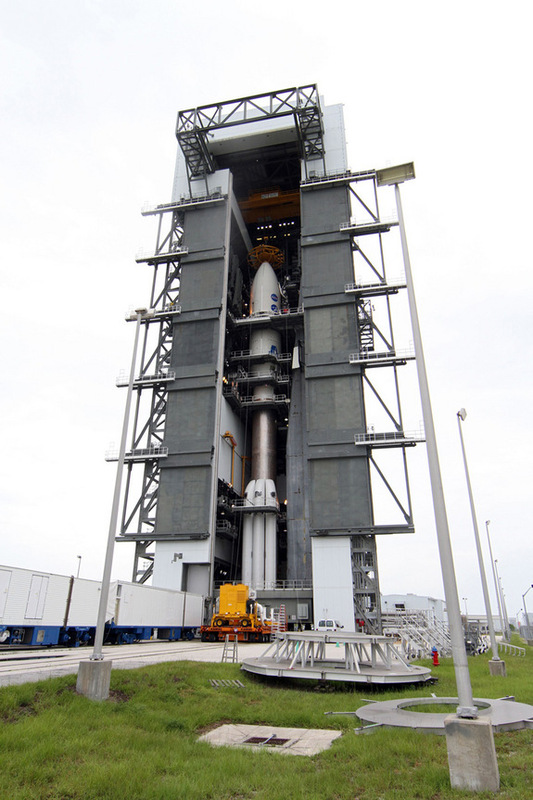 We could see the Atlas V rocket on the launch pad venting its liquid oxygen tank, ready to leap off the pad and into space. 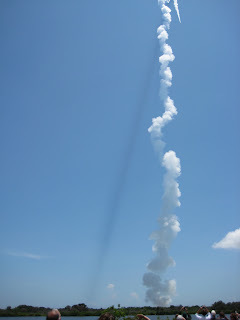 Finally, at 12:18pm, the launch team polled all the different individuals involved with the launch, and the launch was a "go" for 12:25pm. My Tweet seemed a bit skeptical, but this seemed like the real deal. The launch team determined the leak to be fixed and it was safe to proceed, and the range cleared out the lost boater. We all made our way out to the lawn for the launch. Since this was my first launch, I decided that my cameras would stay in my pocket for the initial liftoff, so I could soak in the experience. My little Canon point and shoot couldn't capture the moment like the professional NASA photos anyway, so I'll just show you some of those. As we approached 12:25pm, it was apparent that this would be a "go", and we wouldn't have to worry about a scrub. 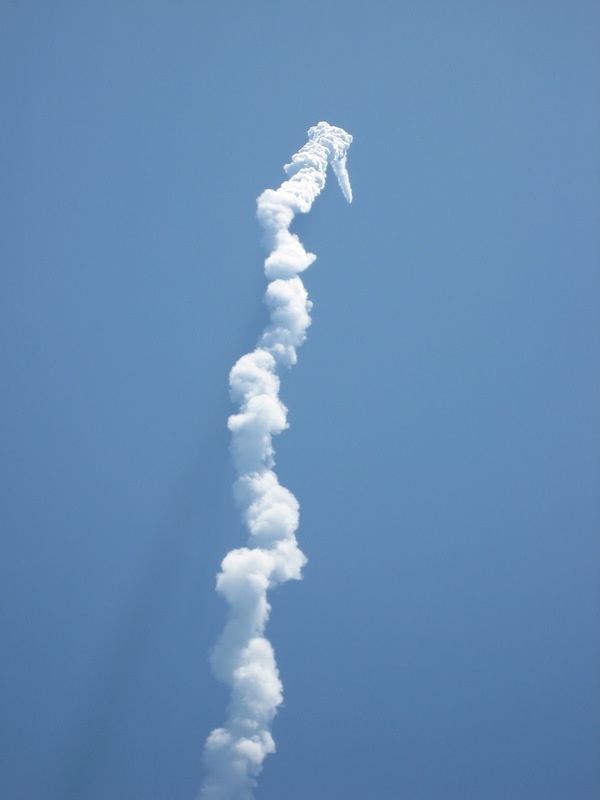 We all chanted 5-4-3-2-1 and all of a sudden, the Atlas V rocket began to rise above the treetops. This was an Atlas V version 551 rocket, so the five solid rocket boosters strapped to this thing made it just jump right off the pad. Even though we were four miles away from the launch pad, this baby appeared to be moving very fast. The Atlas V rocket achieved mach 1 about 30 seconds after launch. It was an intense flame, almost too bright to look directly at. 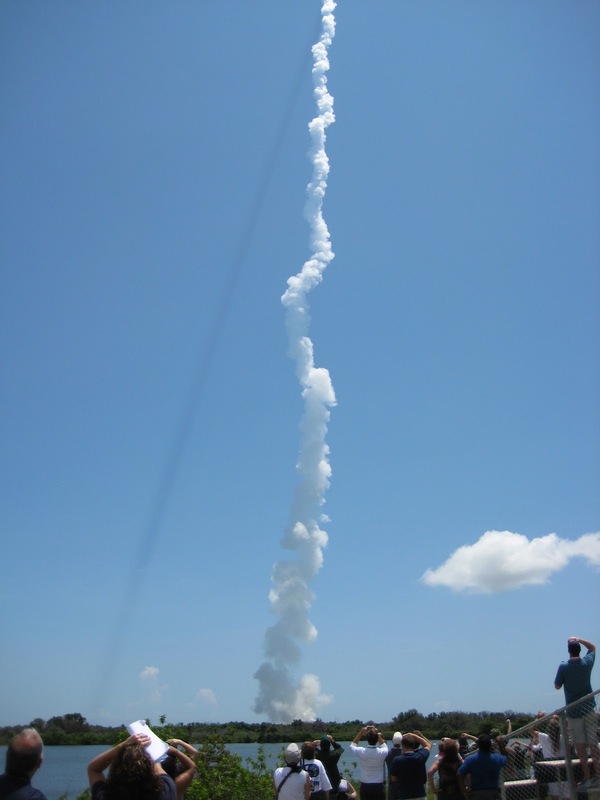 A few seconds after launch, the sound came rolling across the Turning Basin lake and hit us. It was a powerful sound like I had never experienced before. Like I mentioned, I've watched many, many launches on TV and online, but microphones and speakers just can't accurately reproduce the sound, and the feeling of the sound, that you experience in person. I loved feeling the rumble of the solid rocket boosters pushing Juno toward space. Ten seconds after launch. The black line you see on the left side of the smoke plume is a shadow cast by the plume. Ten seconds after launch, when I snapped out of my awe induced trance, I pulled out my camera and shot the picture above. The smoke plume was so thick it cast the black shadow you see on the left side of the photo. The rocket moved so fast, it was a tiny dot in the sky before you knew it. We had perfect weather, with no clouds to obstruct our view of the Atlas V rocket heading up into space. 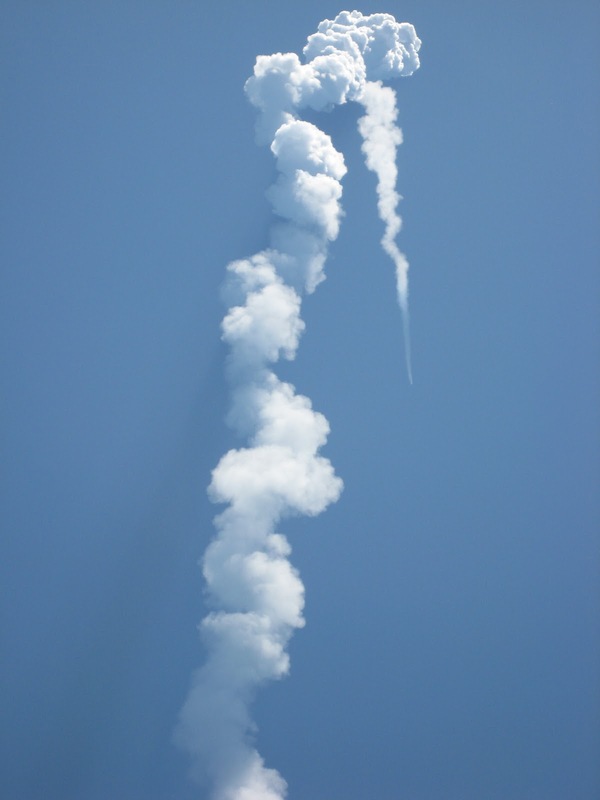 A handful of the last shuttle launches had to deal with low, thick cloud ceilings, so those people viewing the launch only got to see it for a few seconds before disappearing above the clouds. It was very cool to watch something climb so high, it just disappeared into space. I tried to capture the picture above just as the Atlas V rocket was too small to see. 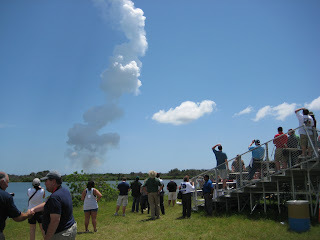 After a successful launch, as the smoke plume started to slowly dissipate, all of the Tweetup attendees hung around the bleachers for a few minutes excitedly discussing what we just witnessed. The adrenaline rush of watching the launch was great. 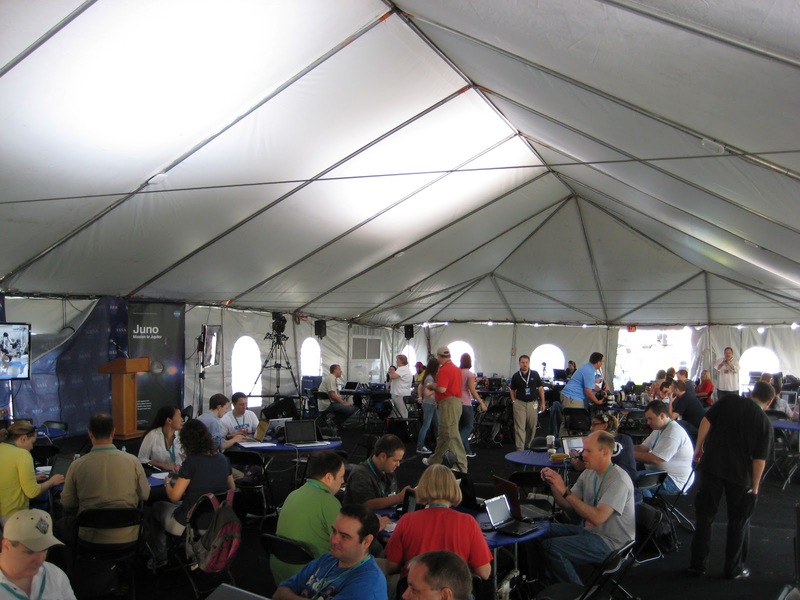 We all eventually made our way back in the tent, and many of us stood around the monitors showing the NASA TV feed. About 30 minutes after launch, we watched NASA TV as the Juno spacecraft detached from the Centaur upper stage and started its five year journey to Jupiter. Read my next blog entry in the "NASA Juno Tweetup" series: "Day 2 - KSC Visitor Complex, Astronaut Hall of Fame and Endless BBQ"
Read my previous blog entry in the "NASA Juno Tweetup" series: "Day 1 - Vehicle Assembly Building tour"
After an intense first day of guest speakers and a great Kennedy Space Center/Cape Canaveral Air Force Station tour, the Juno launch day was upon us. Day 2 of the Juno Tweetup consisted of a morning filled with more great guest speakers, some demos and interactive sessions, finally culminating with the launch of the Atlas V rocket with the Juno spacecraft. My next blog entry will be about the Juno launch, since this post is all about our guest speakers and demos. The NASA social media team really worked hard to put on a couple action packed days for our Tweetup. I'm guessing that one of the most challenging aspects of setting up the Tweetup was coordinating the guest speaking portions of the two days. Both days consisted of some very important people involved with the Juno spacecraft, the Atlas V rocket, or with NASA in general. Trying to schedule all of these people to speak to 150 space loving nerds in a tent the day before launch and the day of launch must have been difficult. The morning started with a talk by Andy Aldrin, who works for United Launch Alliance. 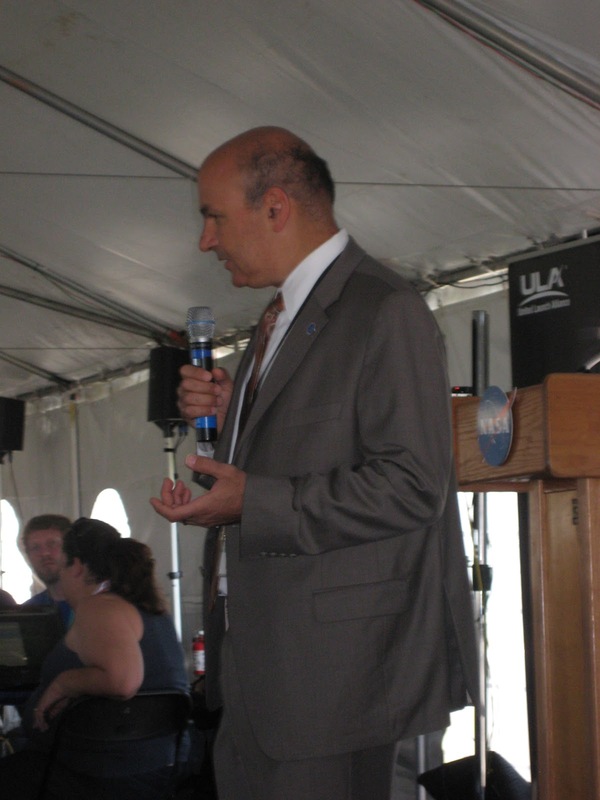 He talked about United Launch Alliance's role in the future of space exploration, and he even talked about his father. Looking at Andy's last name, it should be pretty obvious that his father is Buzz Aldrin. Looks like the space program runs in the blood. When asked about growing up with Buzz Aldrin as a father, Andy said that he lived in Houston on a street where all his friends has astronaut fathers. Hearing the way Andy talked about his father, you can tell he really admires Buzz's accomplishments. Next up was Waleed Abdalati, who is the Chief Scientist for NASA. He gets to set the course for NASA's scientific endeavors, and is the face of NASA in the scientific community. He is a very funny man and an engaging public speaker. He made a statement that many Tweetup participants took notice of (via a flurry of Tweets) stating that your job shouldn't be draining, but rather it should be energizing. If you get home at night and you're physically drained, you body is telling you that's not the job for you. After hearing Waleed's talk, you can tell that he's energized about his job. 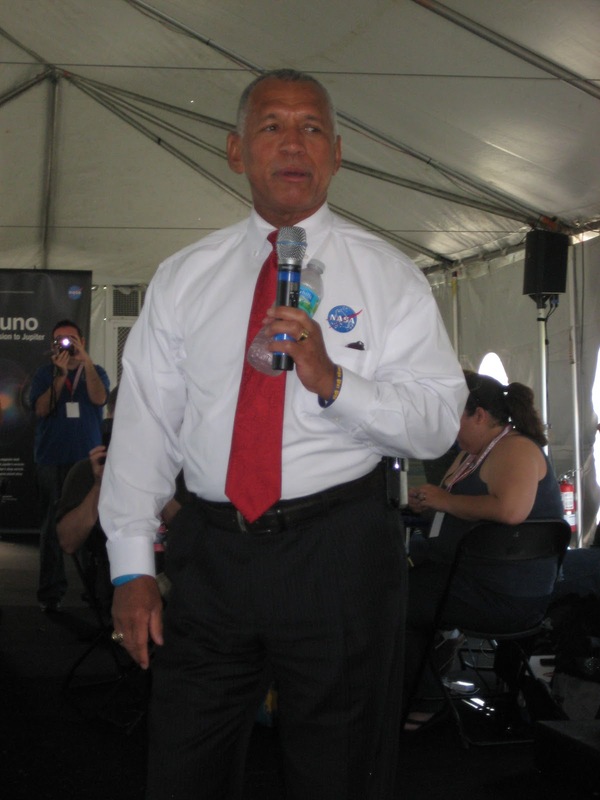 Our next speaker was Charles Bolden, the NASA Administrator (head honcho) talking to us about NASA's future. He's also a former astronaut, flying on the shuttle for four missions. In 1990 he was the pilot of STS-31, which was space shuttle Discovery (which we saw in the VAB) deploying the Hubble Space Telescope. During his speech, I thought to myself "this is the closest I've ever been to someone that's been in space." A goofy thing to think, but true! If you would like to see a video of Charles Bolden's talk to all of us in the Tweetup tent, it's posted on YouTube. The main theme of Charles' talk was making the point that just because the shuttle program has come to an end, that doesn't mean NASA has also come to an end. He promoted the unmanned missions (robotic missions, as he said) as the building blocks to the manned missions of the future. He said that without the unmanned missions, we wouldn't have the data and research to carry out the higher profile manned missions. He also talked about either SpaceX or Orbital Sciences sending up a cargo ship to the International Space Station in early 2012. Charles also mentioned that in early 2012, NASA will put out a request to the private space companies for proposals on their crew capable spacecraft ideas, with the goal of returning American crews (on American spacecraft) to orbit sometime between 2015 and 2017. He also pointed out that there has been (and continues to be) Americans in space aboard the International Space Station for over 10 years. So the U.S. is still committed to space exploration and is in the beginning of a new chapter in the space program. Charles made a point about the importance of Juno using solar cells to power the spacecraft, rather than nuclear power, like many other unmanned spacecraft. When asked by a science teacher in the Tweetup crowd how he would respond to students that say they want to have his job when they grow up, Charles joked "be careful what you ask for." I can understand that comment, in a time when funding is being cut and he constantly has to explain that the shuttle program wasn't 100% of what NASA was doing. He wrapped up his talk by thanking us for our enthusiasm for NASA, and used a fellow space program enthusiast and previous NASA Tweetup attendee, Kate Arkless Gray, as an example of the power of using social media to promote NASA. Kate's an avid Twitter user and space fanatic that has traveled from her home in the U.K. to experience shuttle launches and NASA Tweetups. As he was mentioning Kate, I knew that the NASA Administrator remembering her and mentioning her name would make her year. After his talk, Charles Bolden agreed to join all of us in front of the Vehicle Assembly Building for a group photo. Group photo with Charles Bolden, Waleed Abdalati and Andy Aldrin. You can find me by looking at the water tower to the left of the VAB. I'm in the orange shirt, about four people to the right of the water tower. Doug Ellison demoing "Eyes on the Solar System"
After our group photo in front of the VAB, we headed back into the tent for the demo portion of the morning. 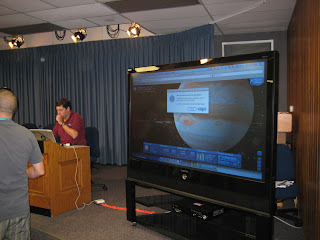 The first demo I attended was from the JPL's Doug Ellison. 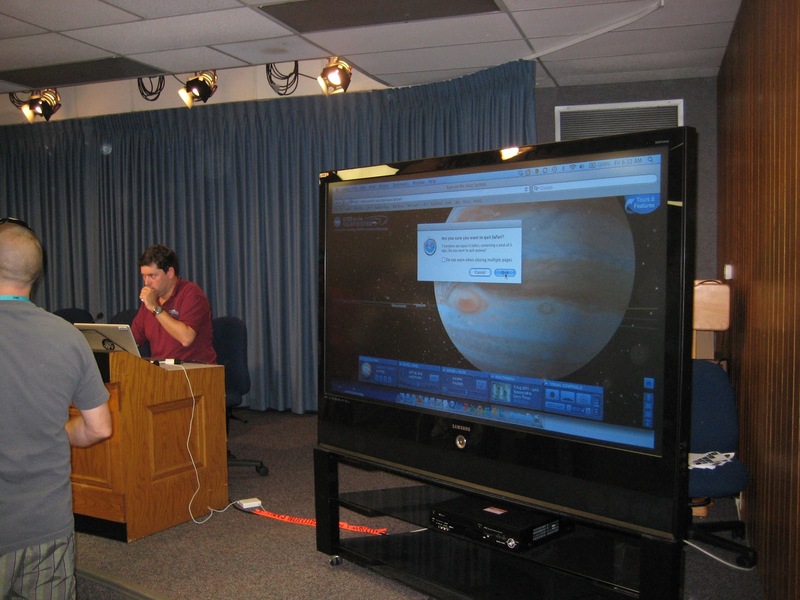 Doug is a Visualization Producer at the JPL, and one of the creators of the "Eyes on the Solar System" website. This is a very cool website that allows you to see visualizations of all the items (naturally formed and man made) in the solar system. If you want to see Juno on its way to Jupiter, this site will show you. How about the Cassini spacecraft orbiting Saturn? You can see that too. I can see myself spending lots of time on this site. I spent the rest of the demo period listening to Preston Dyches, from the JPL, talk about some of the materials used on the Juno spacecraft. It seems the keys were finding lightweight materials that would also withstand the harsh environment in space, as well as the healthy dose of radiation that Juno will receive around Jupiter. Preston passed around some of these materials for us to see. One such material is titanium, that is used on Juno to protect many of the scientific instruments. 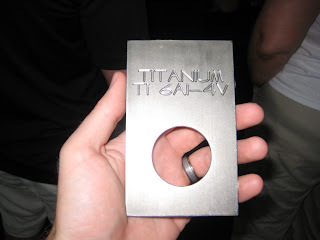 A couple of speakers on the first day also talked about the 1/2" thick casing of titanium around Juno's electronics. As Charles Bolden pointed out, as did other speakers on the first day, Juno is a solar powered spacecraft, rather than nuclear powered. Preston passed around one of the solar cells that make up the large solar panels on the spacecraft. Preson reiterated that Juno needs such large solar panels due to the low intensity level of the sun's rays at Jupiter. Since Jupiter is so far away from the sun, compared to earth, the solar panels near Jupiter will only produce 4% of the electricity that they would if opened on earth. A couple other speakers we heard from during the morning were Rex Englehardt and Mike Ravine. Rex is from NASA's Launch Services Program. As Rex described it, he "buys rockets for a living." 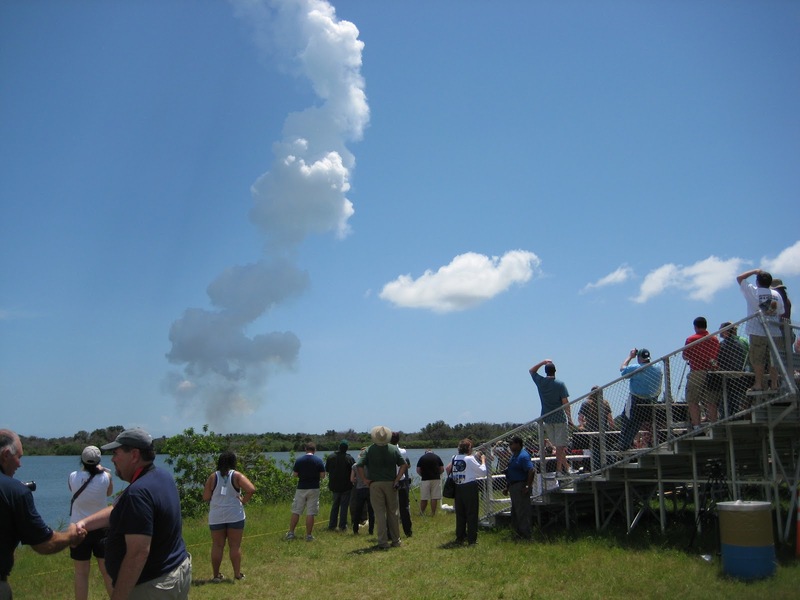 The Launch Services Program is the group within NASA that contracts the private space companies, like ULA, SpaceX and Orbital Sciences, to provide launch vehicles for NASA's unmanned spacecraft. 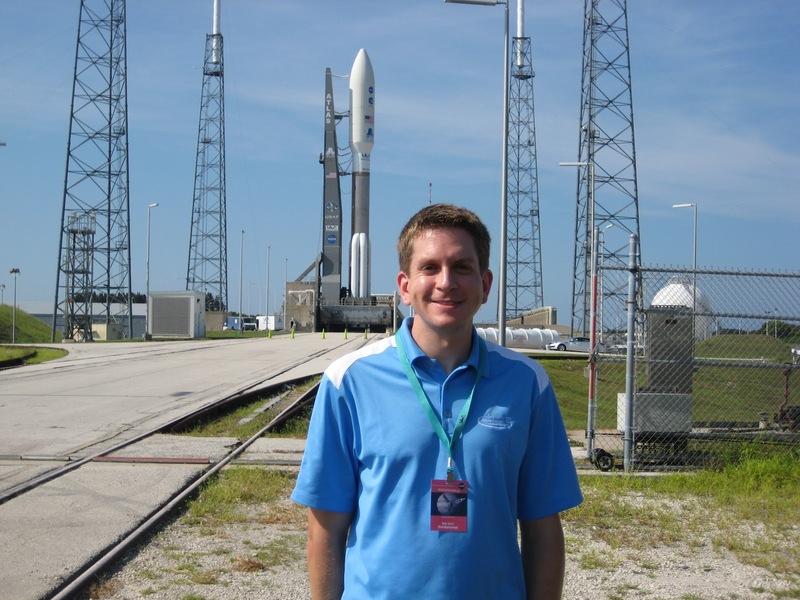 Mike Ravine is the individual responsible for creating JunoCam, which is the camera attached to Juno. It seems that the biggest challenge to creating JunoCam was to create a camera than will withstand the super high levels of radiation that surround Jupiter. I'm going to jump ahead real quick (post launch), since this is a demo that should be included in this section. After the launch, Stephanie Smith from the JPL passed around a piece of the lightest man made solid substance called Aerogel. It's essentially spun glass that looks like a block of frozen smoke. 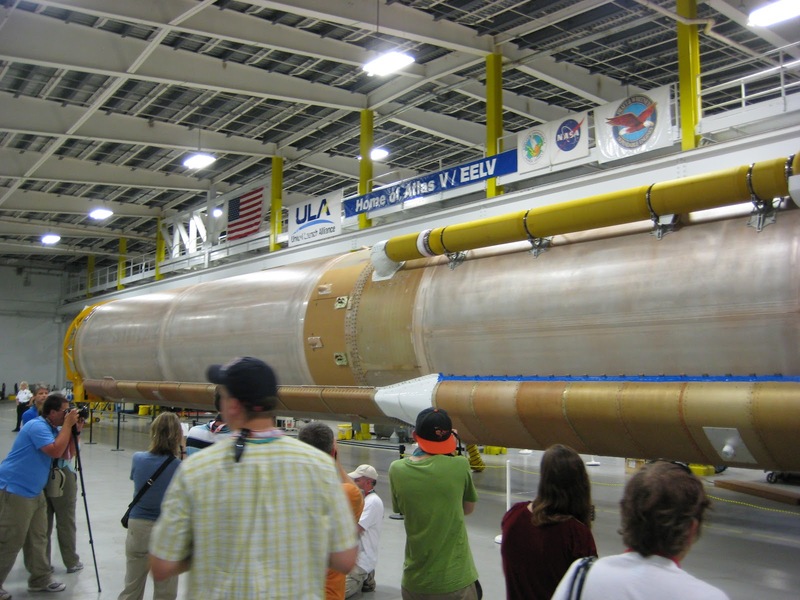 It was used as a lightweight insulation on spacecraft Stardust as well as on the Mars Rover. It was a very odd sensation holding it. Hard to describe how light it was. Even though it has the name "gel" in its title, it's a solid. OK, now flashback to before the launch, for the last speaker of the morning. 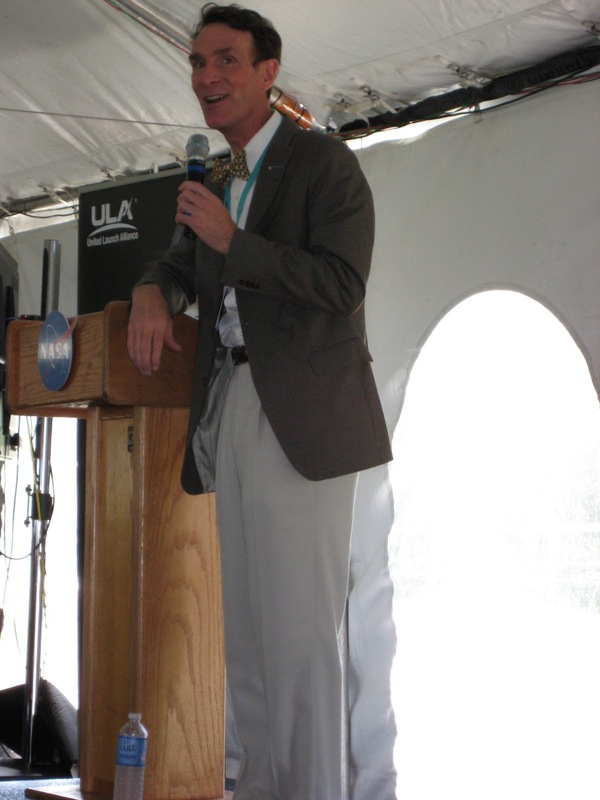 Our final speaker was a big crowd favorite: Bill Nye, The Science Guy. 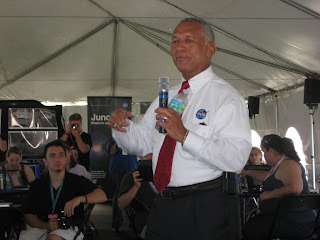 He was at Kennedy Space Center to watch the launch, and agreed to talk to all of us in the Tweetup tent. He's a very enthusiastic guy, and is exactly like you've seen him on TV. If you would like to watch his talk to all of us in the Tweetup tent, it's posted on YouTube. Bill talked about the importance of teaching children math and science, his enthusiasm for the Juno mission and future NASA missions, and talked quite a bit about The Planetary Society, of which he's executive director. He was in a room full of 150 space nerds, so he was in his element. He took plenty of questions from the audience, and even stuck around after his talk and came back after the launch to take pictures with us. He was a big crowd favorite. After Bill Nye's talk wrapped up, we had about 30 minutes until the launch of the Atlas V rocket with the Juno spacecraft. Well, it turned out to be more than 30 minutes until launch, but you can read all about that in my next blog entry detailing the Juno launch. Read my next blog entry in the "NASA Juno Tweetup" series: "Day 2 - Juno launch"
Read my previous blog entry in the "NASA Juno Tweetup" series: "Day 1 - Launch Complex 41 tour"
Our final stop on our tour of Kennedy Space Center and the Cape Canaveral Air Force Station was the Vehicle Assembly Building. As I wrote about in previous blog entries, our visits to Launch Complex 17, the Atlas V Spaceflight Operations Center, Launch Complex 41, and a drive-by of Launch Complex 39A were all amazing sights, but the VAB was really the stop that we were all looking forward to. This was especially due to the fact that many of us knew about the surprise that was waiting for us inside the iconic building. Bus 1B's tour guide, who's name completely escapes me, worked for many years in the VAB, so I'm able to regurgitate many VAB facts that he told us. 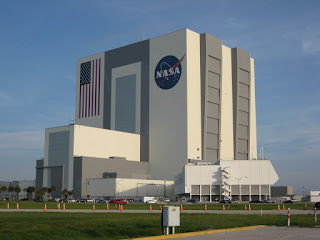 The Vehicle Assembly Building is a building that is rarely visited by those of us that don't work for the space program. Including it on our tour was a treat that we all were just giddy about. Built in 1966, the VAB was constructed to vertically assemble the 363' tall Saturn V rocket and capsule that transported humans 235,000 miles away, to the moon. 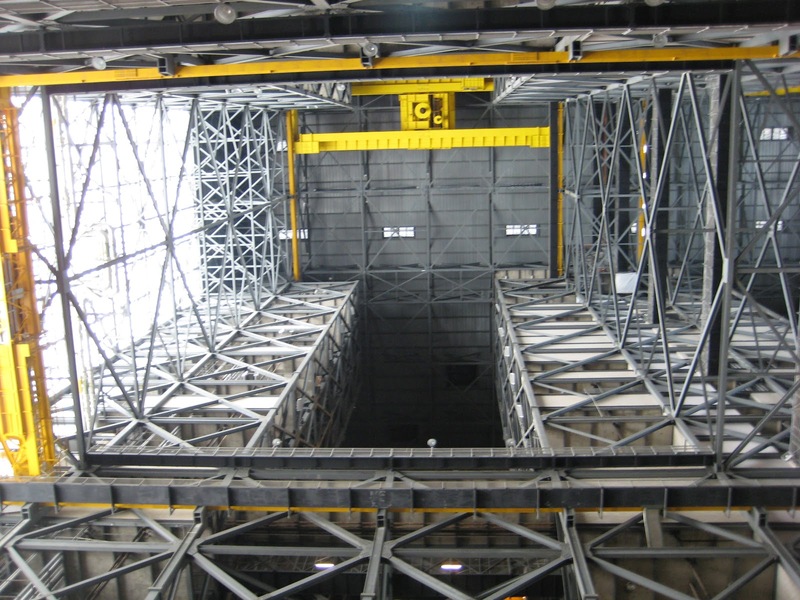 All of the separate pieces of the massive rocket would be brought into the VAB, hoisted with a crane on the ceiling, and placed into position on the Mobile Launcher Platform. The support structure (tower) would be attached to the Mobile Launcher Platform, and the whole package (rocket, MLP and support structure) would be moved by the Crawler from the VAB to Launch Complex 39A or 39B. The assembly of the space shuttle's orbiter, external fuel tank, and solid rocket boosters would follow the same idea as the assembly of the Saturn V.
The volume of the VAB equals almost four Empire State Buildings. The building is so large that without proper cooling and air handling, a rain cloud can form inside it up along the ceiling. It also takes the building about 12 hours to adjust to temperature changes outside, due to the massive volume of air inside it. 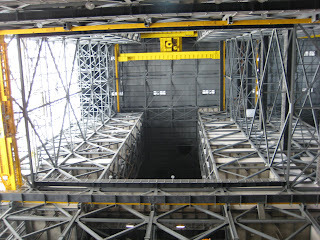 As we entered the VAB, I snapped the photo you see above. This photo doesn't even begin to represent the sheer size of this building. Known to be the tallest one story building in the world, you can look up in the transfer aisle and see the ceiling 526' above you. 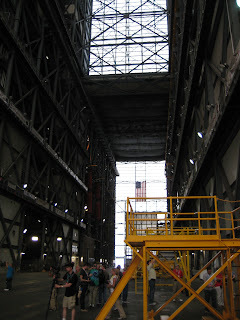 We entered the VAB on the south side, so the view you're looking at above is facing north. There are four "high bays" that surround the transfer aisle, with service structures that surround each high bay. 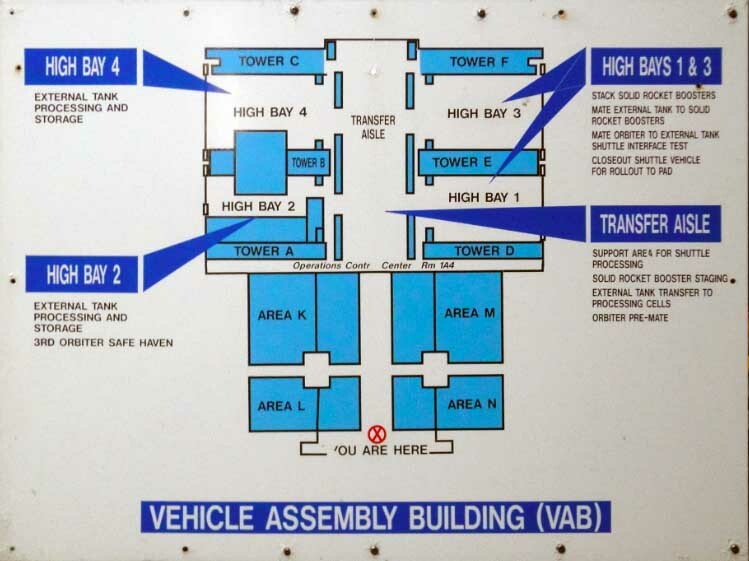 Peter Crow has a good picture of the VAB floor plan on his blog. Looking at the picture above, you can see the crane that is on the ceiling of the transfer aisle. The assembly process would start with the component (shuttle orbiter, Saturn V lower stage, external fuel tank, etc.) trucked in horizontally and parked in the transfer aisle. 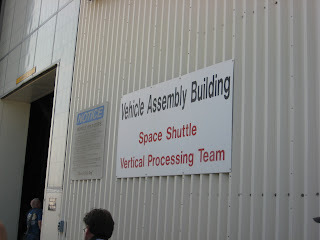 (The VAB is right next to the Orbiter Processing Facilities, which are the shuttle storage hangers, so this wasn't a long trip for the orbiters.) The crane you see above would lift the pieces up, and move them laterally into one of the high bays to be mated with the other pieces on the Mobile Launcher Platform. After assembly, the bay doors on the east side of the VAB would open. You can see those doors in the very first picture of this blog entry, next to my right shoulder. Those doors take 45 minutes to completely open or close. The space shuttle only needed the bay doors opened halfway up, but the Saturn V needed them open all the way to the roof, showing the height difference between the two. 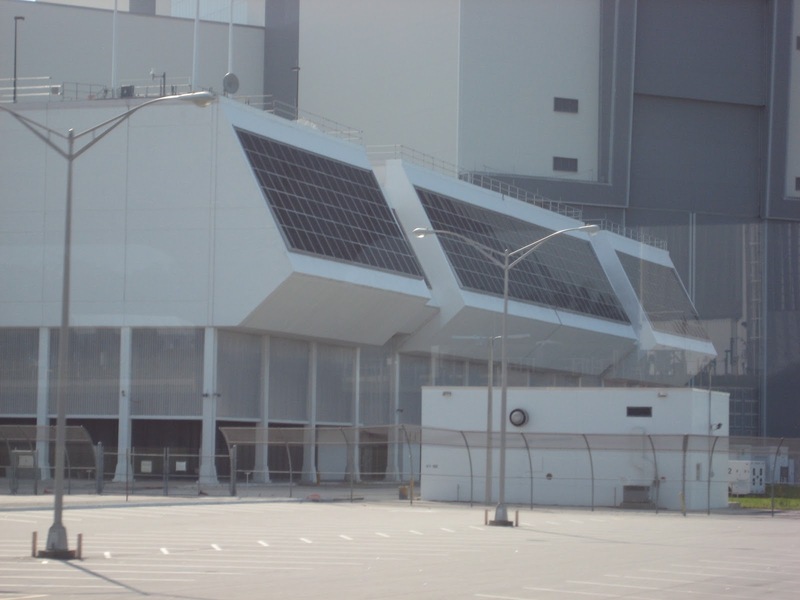 After the bay doors opened, the Crawler would vertically move the Saturn V or shuttle down the Crawlerway along Saturn Causeway, down to one of the two Launch Complex 39 pads. There are some great pictures of the shuttle assembly process inside the VAB on this Boston.com page. As we made our way down the transfer aisle, we finally came to the surprise waiting for us at the bottom of high bay 4: Space Shuttle Discovery. One of the many space enthusiasts I follow on Twitter had just posted pictures of a shuttle in the VAB, so I was really hoping that it was still there, and luckily it was. Since the shuttle program came to an end less than a month prior to my KSC visit with the STS-135 mission (Atlantis), the shuttles were being processed for donation to museums. 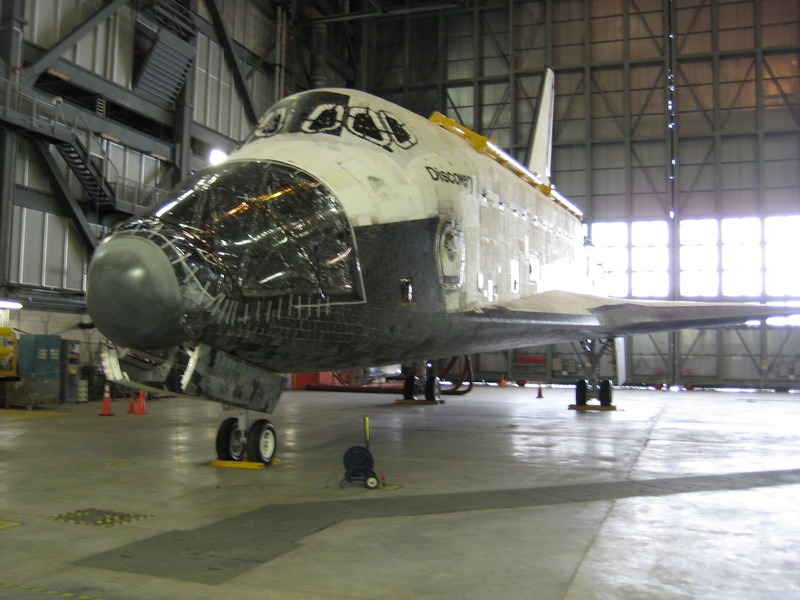 Discovery is going to the Smithsonian Air & Space Museum in DC, Endeavour is being donated to the California Science Center and Atlantis will remain at the Kennedy Space Center Visitor Complex. 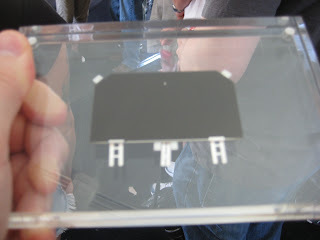 It was amazing to stand 20 feet away from such an important piece of technology. Discovery has left earth 39 times, logging 148 million miles traveled and, when totaled up, spent almost a full year orbiting earth. I was star struck (pun intended) as I stood next to this machine. I stood there and told myself that this is a once in a lifetime experience. 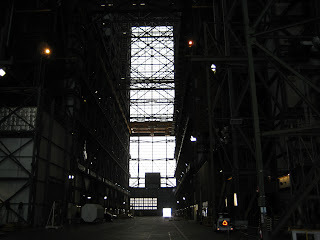 I'll never have another chance to stand next to a space shuttle inside the Vehicle Assembly Building. I realized that this would be one of those moments that I would remember for the rest of my life. My kids and grand kids will roll their eyes every time I tell them about the day I stood next to Discovery in the Vehicle Assembly Building. As you can see, part of the nose of Discovery has been removed. Technicians are in the middle of decommissioning all three remaining orbiters to remove any potentially harmful components. 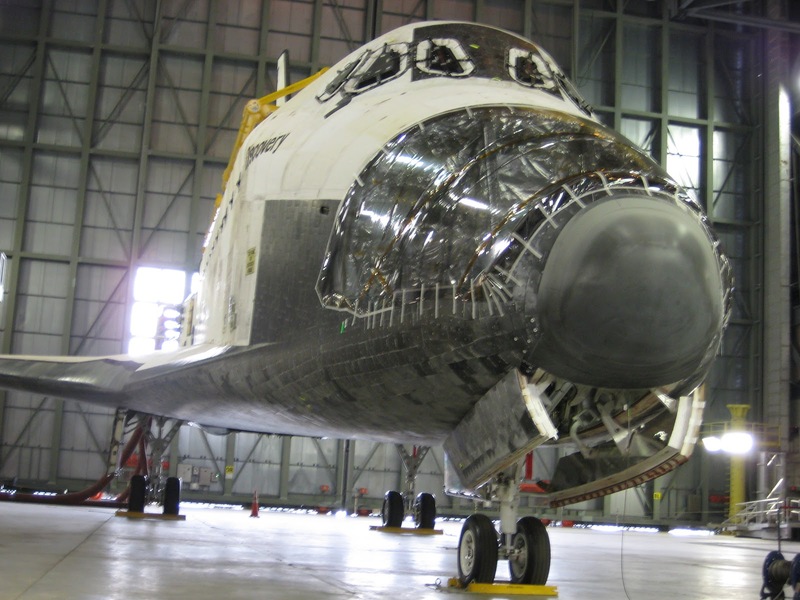 Endeavour and Atlantis were next door in the hangers at the Orbiter Processing Facility receiving the same treatment. As sad as it is to see the shuttle era come to an end, this simply means that NASA and private space companies are ready to move into a new era of space exploration. The space shuttle has been flying since the 1980's, so it's time for technological advancement to take over and push the space program ahead. 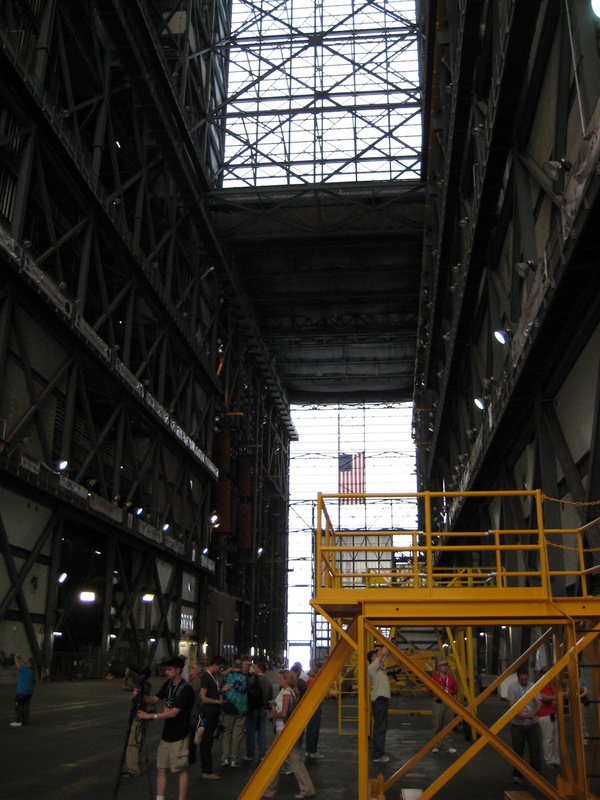 Looking back down the transfer aisle, you can start to get an idea of the immense size of the VAB by looking at the photo above, with people in the shot for reference. 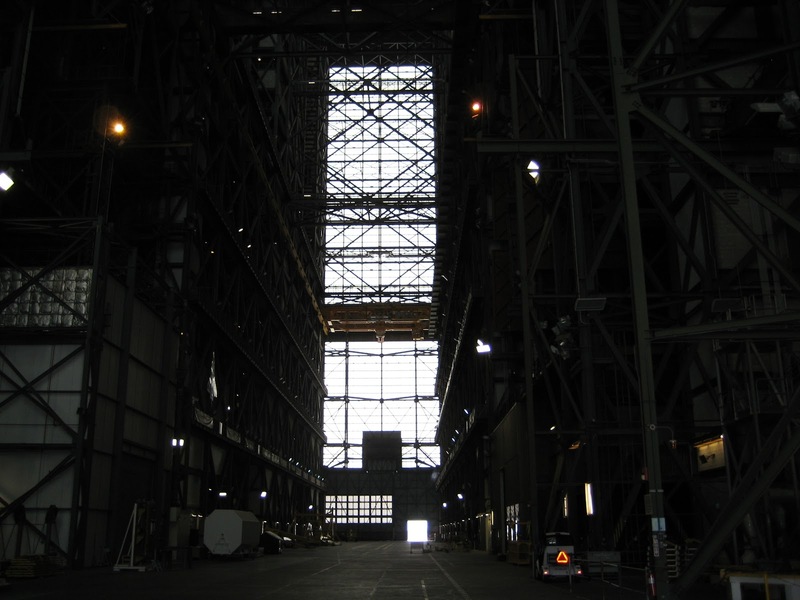 The VAB currently sits under utilized, as NASA makes important decisions as to the future of space exploration. The VAB was set to become the home to the Ares rocket assembly, but after the Constellation Program was canceled, NASA's next human launch vehicle and spacecraft are still being determined. As I walked away from high bay 4, I took one last look at Discovery. I really didn't want to go, and was one of the last people to walk away from the shuttle. I was just trying to wrap my head around the amazing history this machine had made, and the incredible places it had been. 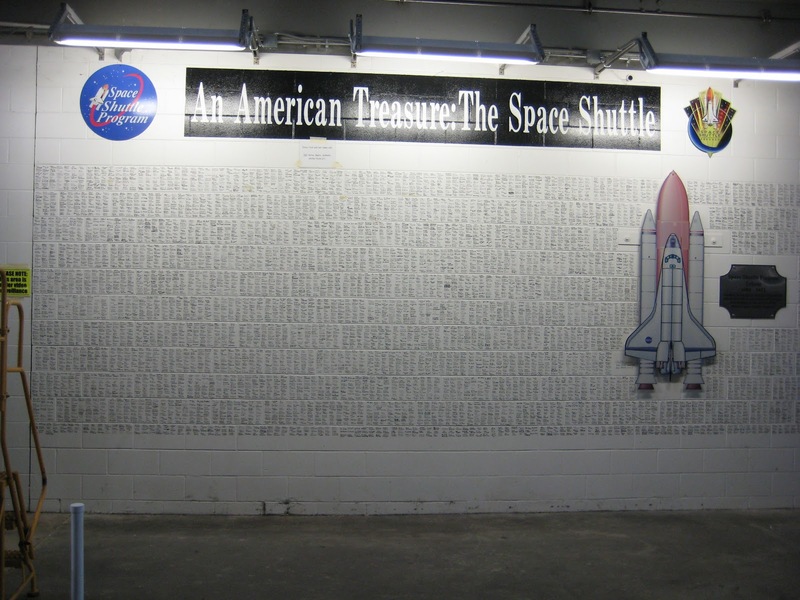 As we were walking back down the transfer aisle toward the exit, we passed this wall, with thousands of signatures of many of the technicians that worked on the space shuttle program. 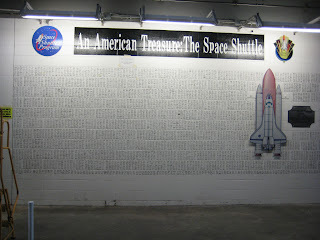 It was amazing to see how many people it took to maintain and launch the shuttle fleet. We all piled back into bus 1B, which returned us to our Tweetup tent at the Launch Complex 39 Press Site. This marked the end of day one, and what an intense day it was! I had a nice dinner with two fellow Tweetup attendees that night, Amanda Marron and Ranz Adams, and I think we had a really hard time wrapping our heads around what we had experienced on day one. Amazing guest speakers and a truly unforgettable tour of America's busiest spaceport. Early to bed, since tomorrow is launch day for the Atlas V rocket and the Juno spacecraft. Read my next blog entry in the "NASA Juno Tweetup" series: "Day 2 - guest speakers and demos"
Read my previous blog entry in the "NASA Juno Tweetup" series: "Day 1 - Atlas V Spaceflight Operations Center tour"
So far our amazing tour of Kennedy Space Center and the Cape Canaveral Air Force Station has included stops at Launch Complex 17 to see the Delta II Heavy that will launch the GRAIL spacecraft, the Atlas V Spaceflight Operations Center that houses the firing room and an Atlas V that will launch toward Mars in November, and coming up in the next blog entry, the Vehicle Assembly Building with a little surprise inside. That's jumping ahead, because this entry is all about the reason I spent two days participating in this Tweetup: Launch Complex 41 with the Atlas V rocket that will launch Juno tomorrow. As bus 1B made its way from the Atlas V Spaceflight Operations Center toward Launch Complex 41, we passed by Launch Complex 40, which is currently used by SpaceX. SpaceX is one of the exciting, up and coming, private space companies that seem to be shaping the future of space exploration. Their big money maker is the Falcon 9 launch vehicle, and their Dragon spacecraft that can either carry cargo to the International Space Station, or carry humans in a capsule. The company is headed by Elon Musk, a 40 year old who made most of his money as one of the founders of PayPal. He has wonderful visions of private companies involved in the future of space flight, and is continually dumping money into developing and expanding SpaceX. Click here to watch a (slightly outdated) tour with Elon of SpaceX's Cape Canaveral facilities and Launch Complex 40. SpaceX is the current resident of Launch Complex 40, which was previously used by the Titan rockets since the 60's. 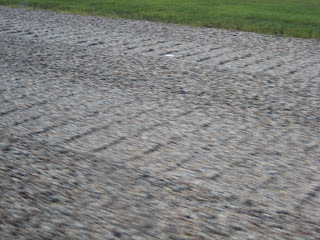 As we drove by, we noticed their shiny (literally) new building that is used to process their Falcon 9 launch vehicle. Just last week, the state of Florida approved $7 million in funding to stimulate the state's aerospace industry, and it looks like SpaceX will be the recipient of that money. This will allow SpaceX to expand their facilities at Cape Canaveral, and not doubt bring jobs to the region. Past the SpaceX Falcon 9 facility and their Launch Complex 40, we continued down Titan III Road to Launch Complex 41, the current home of the Atlas V rocket with Juno perched on top. 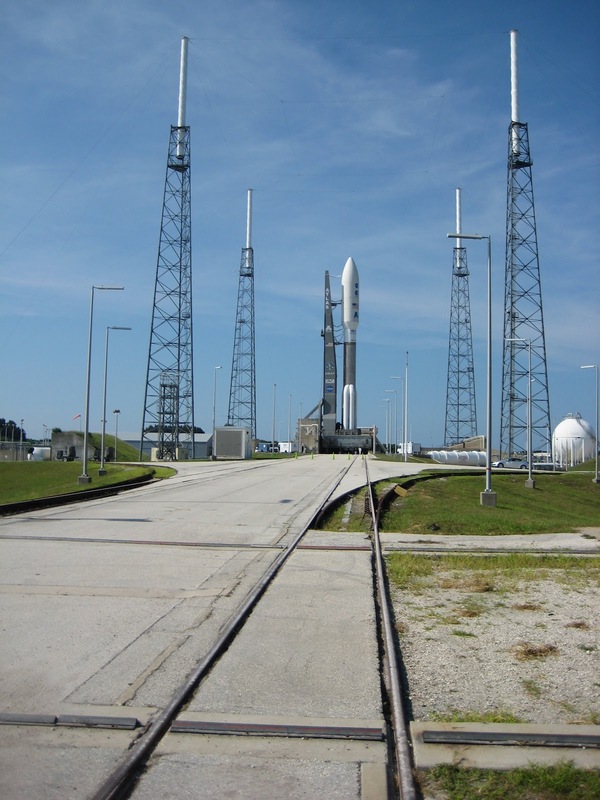 LC-41 is another launch complex that was previously used to launch Titan rockets. Just before reaching LC-41, we passed by the Vertical Integration Facility. Think: mini Vehicle Assembly Building. 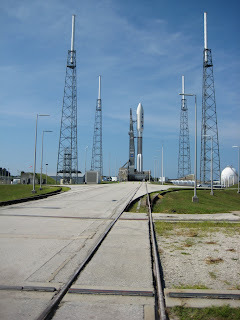 The Atlas V was assembled vertically in this building, the Juno spacecraft was placed on top of the Atlas V, and the morning before launch day, the entire rocket was rolled out vertically on a mobile launch platform down railroad tracks on Titan III Road (seen in photo below), and onto the pad at LC-41. This concept is different than, for example, SpaceX's Falcon 9 rocket launches. The Falcon 9 is assembled horizontally, then rolled out to Launch Complex 40 and stood upright at the pad. From the LC-39 Press Site and our Tweetup tent, four miles away from LC-41, all you can see are these four lightning towers and the very tip of the rocket. Florida weather can pretty wild, so all the launch complexes on Cape Canaveral have extensive protection from lightning strikes. The version of Atlas V rocket being used to launch the Juno spacecraft is a version 551, which is the largest version of Atlas V. You can see two solid rocket boosters on this side of the rocket, and there are three other SRB's on the other side. The people standing in front of the mobile launch platform give you a good idea of how tall this rocket is: 197 feet. The Juno spacecraft is encapsulated in the white bulb/cone that you see on the top. The SRB's and the bottom stage of the Atlas V will provide the initial thrust for liftoff, but they'll eventually be depleted and detach, and the upper Centaur stage will take over. The white cone will split open, exposing the Juno spacecraft, which will detach from the upper Centaur stage and begin its five year long trek to Jupiter. Juno will travel out into space for one year, head back toward earth for one year, slingshot around earth to gather speed, and spend the next three years heading to Jupiter. 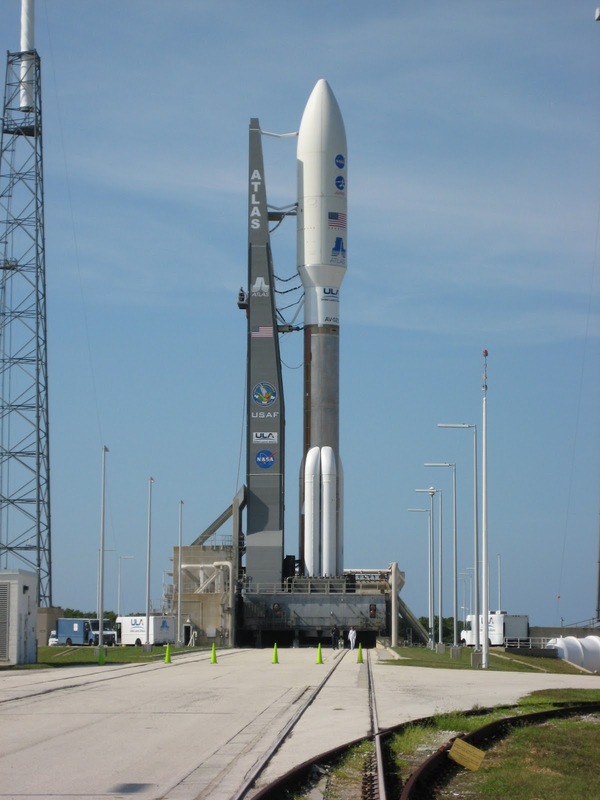 The Atlas V is an expendable launch vehicle, meaning the rocket is used one and not recovered. It was amazing feeling knowing that I was standing next to a rocket that would launch less than 24 hours later, carrying a spacecraft that will study a planet that 400+ million miles away. It really puts things into perspective when you start thinking about that. As we jumped back on bus 1B and headed toward our next destination, the Vehicle Assembly Building, we drove on Cape Road and took a left at Launch Complex 39A, the last standing space shuttle service structure. Less than one month earlier, this was the location that STS-135 Atlantis launched from, which was the final space shuttle mission. Our bus slowed down long enough for us to snap some close up photos of the historic pad. One of the buses (number three, I believe) was able to convince their tour guide to stop and let them get out to take pictures of LC-39A. Unfortunately, due to our little missing door incident earlier, we were pressed for time, so we didn't stop. 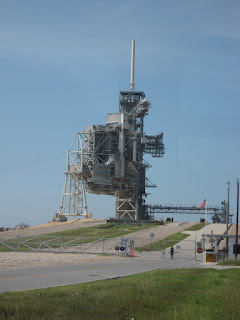 It was still amazing to be so close to the pad, even though we were in a bus. When the program was still in existence, the space shuttle would be vertically attached to the external fuel tank and the solid rocket boosters in the Vertical Assembly Building, then placed on the Mobile Launcher Platform, and the Crawler would move the whole package along Saturn Causeway vertically out to one of the LC-39 pads. The Saturn V rockets in the Apollo program followed the same path. 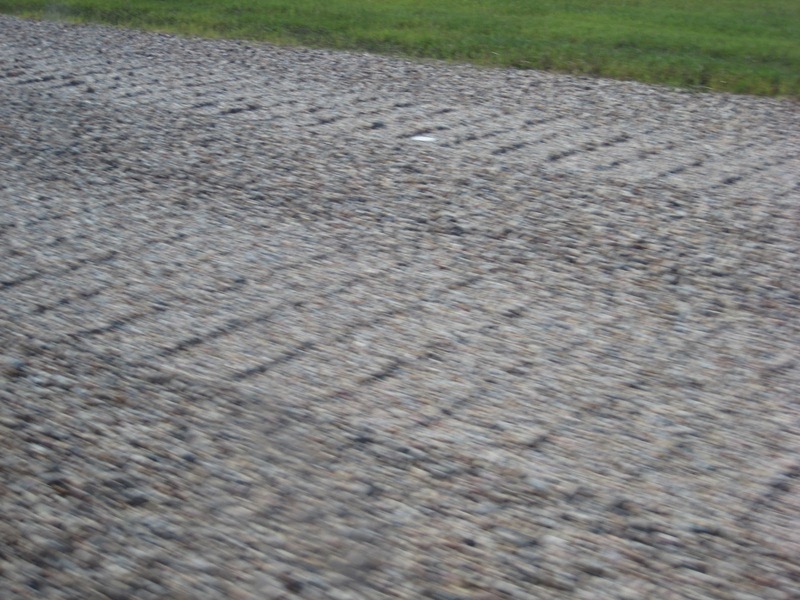 As we drove along Saturn Causeway, I noticed the crawler tracks were still visible from when the final space shuttle was rolled out to the pad. The stones used along the Crawlerway are river rock brought in from Alabama and Tennessee, because that special rock has less of a chance of creating a spark as the 2,721 ton Crawler moves over it. Just before we got to the Vehicle Assembly Building, we passed by the LC-39 Launch Control Center, which houses (behind the black windows) the firing room used for the Saturn V and shuttle launches. As soon as the Saturn V or shuttle would clear the tower, control of the rest of the mission would be handed over to the Mission Control Center at Johnson Space Center in Houston. Hence the famous Apollo 13 quote: "Houston, we've had a problem." One final stop left on our amazing KSC and Cape Canaveral tour, and they've saved the best for last: the Vehicle Assembly Building with a little surprise waiting for us in there. Read my next blog entry in the "NASA Juno Tweetup" series: "Day 1 - Vehicle Assembly Building tour"
Read my previous blog entry in the "NASA Juno Tweetup" series: "Day 1 - Launch Complex 17 tour"
After our stop at Launch Complex 17 to see the Delta II Heavy that will launch the GRAIL spacecraft, we hopped in bus 1A to continue on our tour to the Atlas V Spaceflight Operations Center, Launch Complex 41 with the Atlas V rocket that will launch Juno tomorrow, and finally the Vehicle Assembly Building with a little surprise inside. 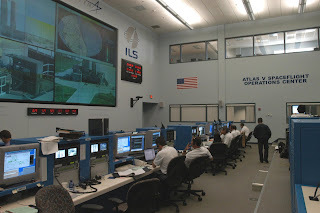 You'll read about Launch Complex 41 and the VAB in future blog entries, because this entry is all about the Atlas V Spaceflight Operations Center. 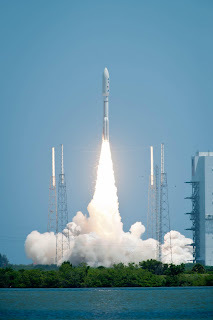 United Launch Alliance is the private company that produces and launches the Atlas V, Delta II and Delta IV rockets. 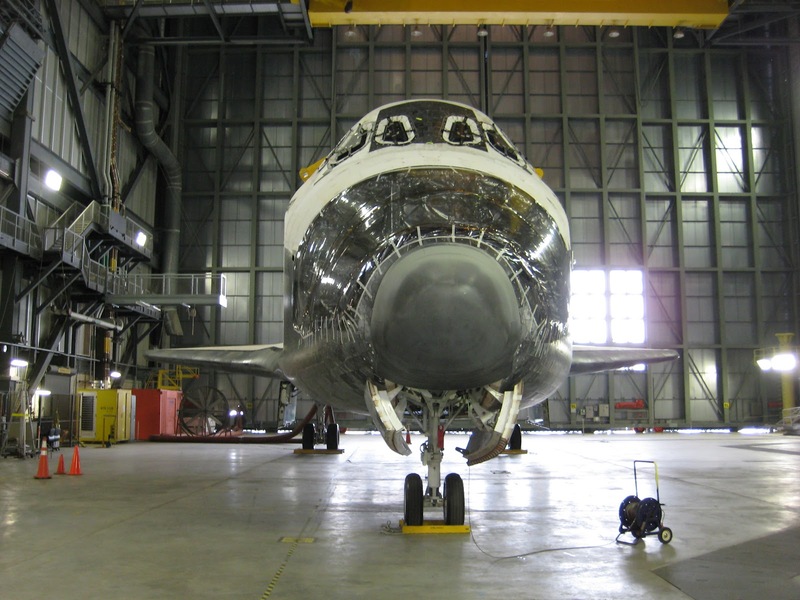 The recently retired space shuttle is the only launch vehicle that NASA owns. 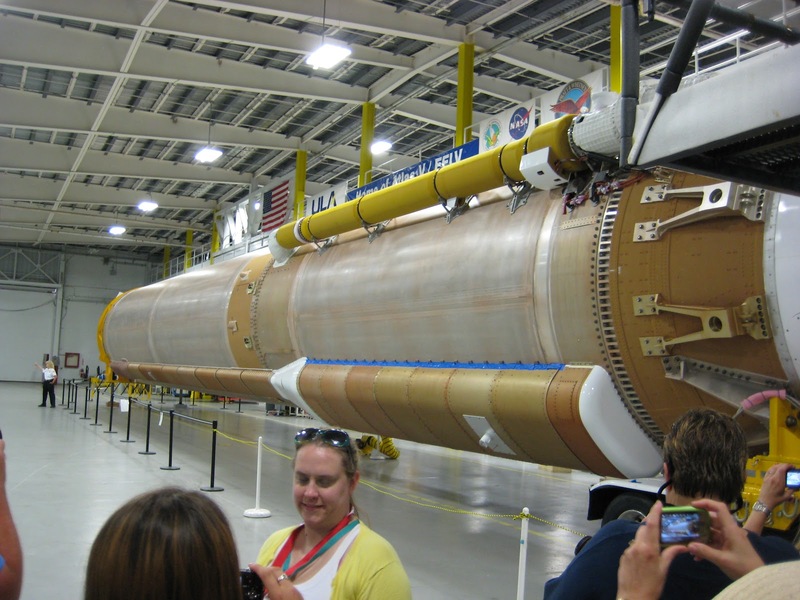 Otherwise, they rely on private companies to produce launch vehicles for NASA missions. 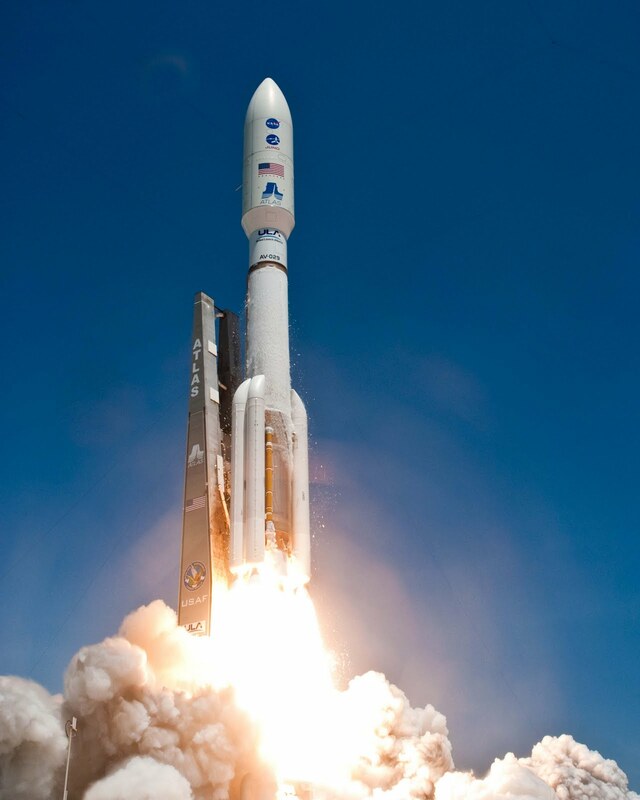 Popular private space companies are SpaceX, Orbital Sciences, and United Launch Alliance. 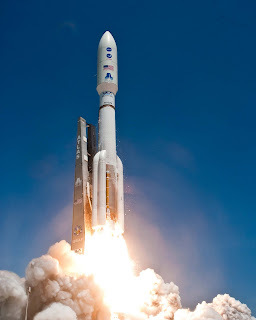 ULA is co-owned by Lockheed Martin and Boeing, who produce the Atlas and Delta rockets. You may be thinking the same thing that SpaceX did in 2005, and that's why they filed suit against Boeing and Lockheed Martin, accusing them of violating antitrust laws when they decided to create ULA. That suit got tossed out and ULA formed in 2006. I mention all of this, because when we stepped foot in the Atlas V Spaceflight Operations Center, operated by ULA, I started thinking about the private sector's involvement in the future of space exploration. Now that the space shuttle program has come to an end, the private space companies are all presenting NASA with launch vehicles that will carry astronauts and cargo into space for future missions. With the perception that the privately owned companies can perform these tasks faster and cheaper than a government run organization, it looks like the future of space flight will involve NASA and the private sector working hand in hand. When we arrived at the Atlas V Spaceflight Operations Center, I could immediately notice the difference between NASA and the privately owned ULA. ULA operates the Atlas V Ops Center, so it was ULA employees giving us the tour. Right off the bat they explained that everyone must stay together, and we could only snap pictures when they said it was OK to do so. There were always multiple security guards and ULA employees with us, making sure we didn't wander down a hallway that we shouldn't be in. 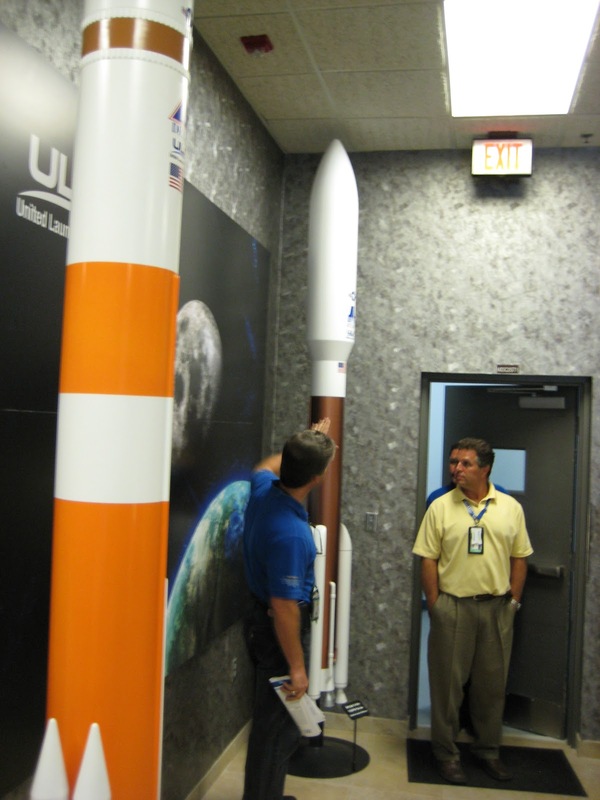 A couple of times a fellow Tweetup participant cracked a joke, but the ULA employees weren't having any of it. It was all business there, and I suppose I can see why that was the case. They had a $1.1 billion spacecraft (Juno) sitting on the tip of their Atlas V rocket that was set to launch the next day. If anything went wrong with their launch vehicle and Juno was destroyed...well...I wouldn't want to be on the receiving end of that phone call. We were up on the second floor, in the glass windows looking down on the control room. It would be great to witness that room in person on launch day, but the viewing area is reserved for the clients that purchased the Atlas V they're launching, and I don't have $200 million to drop on a rocket. Someone from our group jokingly asked where the big red "launch" button was, and it turns out there's no such button. The ULA employee did say that there's an actual button at the launch director's console for aborting the launch. After checking out the firing room, we went back downstairs and were led into a large hanger that was currently home to the Atlas V rocket that will launch the Mars Science Laboratory mission and Curiosity Rover in November 2011. Looking at the picture above, you can see the upper stage is missing. It's actually in the room with us, but it's detached and behind the lower stage that you see. We weren't allowed to photograph the upper stage, and the ULA employees and security guards made sure we didn't venture around the lower stage for a sneak peek. I'm sure there was a perfectly acceptable reason for why they didn't want images of the detached upper stage floating around blogs just like this one. We're talking about multimillion dollar rockets, so I can see why a privately owned company would want to keep some secrets to themselves. It was an amazing feeling standing ten feet away from a rocket that will soon be propelling a spacecraft toward Mars. The picture above shows the bottom of the lower stage, obviously lacking the solid rocket boosters. The lower stage sits on a frame of wheels, essentially making it a super expensive tractor trailer. It's transported down the highway towed behind a truck. Make sure to give the driver a wave next time you pass an Atlas V on the highway. This hanger was the last stop on our tour of the Atlas V Spaceflight Operations Center. As we piled into bus 1A, we couldn't help but notice that the bus' front door was now sitting on the rear seats. No clue how it happend, but while we were touring the Atlas V Spaceflight Operations Center, our bus' door fell off. Well, who needs a door anyway, right? Unfortunately, NASA decided that we needed a door, so we had to wait for a replacement bus. If you know anything about Florida in August, you know that temps tend to run on the high side, and the humidity makes it possible to slice the air with a knife. Combine those facts with sitting on a crowded bus, on pavement, in the afternoon sun, with no door....well, you get the picture. Luckily bus 1B showed up to save us, and we were on our way to our next stop: Launch Complex 41 to see Juno atop its Atlas V.
Read my next blog entry in the "NASA Juno Tweetup" series: "Day 1 - Launch Complex 41 tour"